Notes: Based on the third novel in Kikuchi Hideyuki's Vampire Hunter D series. D has been hired to track down Meier Link, a notoriously powerful vampire who has abducted a human woman, Charlotte Elbourne. D's orders are strict - find Charlotte, at any cost. For the first time, D faces serious competition. The Markus brothers, a family of vampire hunters, were hired for the same bounty. D must intercept Meier and conquer hostile forces on all sides in a deadly race against time. Despised by vampires for his profession and by humans for the blood in his veins, D relentlessly pursues his prey for a price. 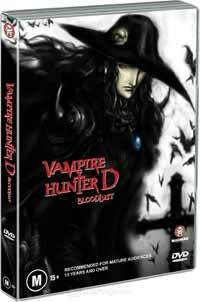 For those who have seen the first Vampire Hunter D anime, I'm pretty sure each of you sat through the movie pointing out faults and deciding on features you'd put into the movie if you were the one who made it. And I'm willing to bet a reasonable sum of money that this would be the title you'd end up with. Yes, people! Madhouse -- who brought us the excellent Ninja Scroll -- yet again brings the goods in this excellent vampire action horror adventure bound to please even the most ardent VHD fans. For one, the art and animation is absolutely astounding, full of detail and animated so smoothly, you'd think they were alive. The settings, particularly towards the end, will take your breath away. And the characters themselves are drawn, showing their expressions quite clearly, making those who have seen Ninja Scroll nod in recognition and appreciation. The music is also professional fare, orchestral mainly, with added choirs for nice effect, punctuating the fact that this is a horror movie first and foremost. An honest to God vampire horror at that. Also, the dubbing is rather well done. That goes for everyone, without exception. Even D as his not-very-vocal self has a deep, resounding voice. And he does speak more in this feature than his previous effort, even if that's not saying anything much. (No pun intended. ) And the hand ... yes, that's right, his hand talks. And not only talks, but cracks jokes, makes snide comments and tries to be helpful even, on occasion. Yes, the hand speaks -- a lot. And if we put all that aside, even then we're left with a tightly paced action adventure, excellently written in true Madhouse style with all the trimmings one might expect. And don't think you can predict anything, not at first. You think you know why Meier Link kidnapped Charlotte? Probably not. Also, the scene where D needs to buy a new horse will probably stay with you when the movie is done, right there with the ending scene. And the cast.... From D to Meier Link, the Markus brothers, Leila, Carmila, and, of course, Charlotte; everyone is written and played excellently. No one-dimensional characters here, and none are wasted either. Even the Barbaroy, an old clan of mercenaries, all of them supernatural beings, have their role and are portrayed very well. "If at first you don't succeed...."
Recommended Audience: Well, there is quite a bit of violence - rather bloody violence, at that. One shouldn't be surprised; this is a vampire movie after all. Needless to say, this does make the movie restricted to an older audience.